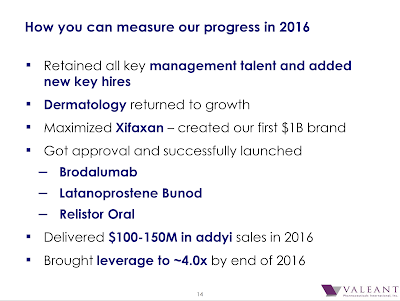 Here is a slide from Valeant Investor Day conference call in December 2015. You can find the original at this link. Only a few months ago they stated that this was how they should be measured in 2016. Today there will be another call. Valeant looks to be down 20% in pre open or maybe it's open. Market finally waking up. Congrats John. You have been smashing it recently. FTK and VRX were great calls. looks like you're going to win this one John.. I wonder what positions Ackman will have to close to cover this margin call.. (assuming he has a margin call). Given that just with Valeant he's going to be 7% down in Q1 (AUM 14bln in Dec, lost about 1bln on Valeant alone so far), I'm curious how many investors he's going to keep after last year's performance. Congrats on the hard fought victory! Ackman is only getting a margin call on twitter. On real life his options trade is limited to a 4% max loss. Margin req is minimal. If you look at the bonds, the stock market clearly overreacted. Some people can't own stock that is in technical default, so they had to sell. Forced selling and capitulation. John, why hasn't PSH posted its 3/15 NAV? Are put options difficult to value? I imagine this is what sports fans feel like when their favorite teams win a big game. I a Canadian CFP with no exposure to VRX and was buoyed by the thought of the corks popping in your office. PSH NA is at a pretty high discount. Their portfolio didn't really drop much yesterday, NAV is now about 15.40, stock trading 12.60. That's an 18% discount. Even if you hate the VRX long, is the rest of the book really in such trouble? It is amazing to me that Philidor is the trigger for this meltdown. I mean this is just the latest debt-fuelled acquisition monster who never generated any new cash flow over and above the price of the acquisitions. Their financials were an utter disaster but somehow sold analysts on "cash earnings". Why this basic narrative still hasn't come to the fore in sell side research is beyond me. I mean it's not like they are going to be generating any investment banking commissions moving forward. Oh man I'd love to sit in on the conversation with their auditors re: Goodwill impairment. Arthur Andersen is the elephant in that room. I normally don't post commentary, but I looked at the infamous VRX options trade of Ackman's. A) In answer to another commenter, of course he is getting a margin call. It's the sort of thing that inevitably happens when you sell puts. B) The more I thought about it, the more I was driven to a conclusion that Ackman is a terrible investor. That well publicised seagull trade is so utterly misguided and amateurish, it's beyond belief. I cannot imagine trusting Ackman with a penny of my money, if my life depended on it. And that applies regardless of the eventual outcome of the VRX saga. "A) In answer to another commenter, of course he is getting a margin call. It's the sort of thing that inevitably happens when you sell puts." Erm, no, respectfully, it's you who doesn't have a clue how derivative margining works in an institutional context. It would be too long and tedious to explain, to be honest. maybe u should get off ur high horse and thank us ignorants for making the mkts inefficent so you can profit off of them. y don't u get off ur high horse and thank us ignorants for making the mkt inefficient so you can making a living trading. "Erm, no, respectfully, it's you who doesn't have a clue how derivative margining works in an institutional context. It would be too long and tedious to explain, to be honest." 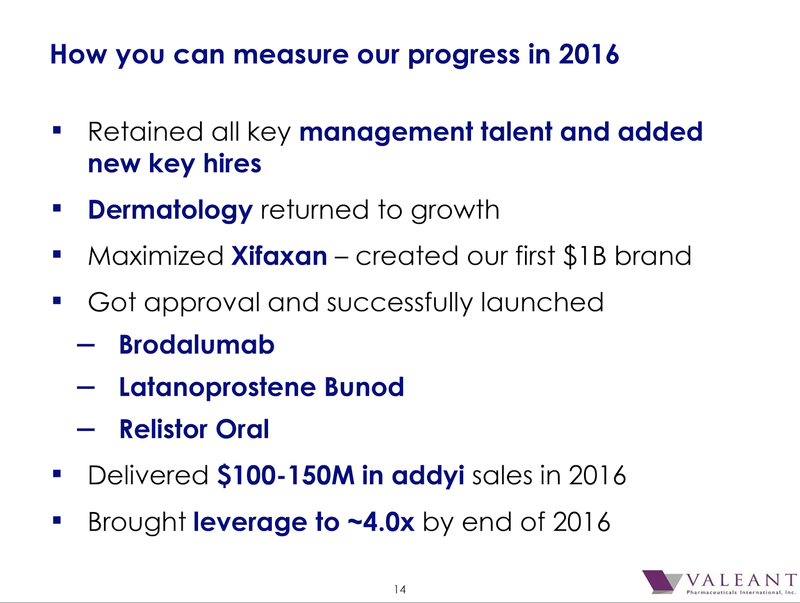 Well done on your work on VRX. Why pay Sprout early? Is there a potential conflict of interest given ownership of Sprout? Alternatively, let's suppose that Ackman's OTC options trades are given up to a PB and portfolio margin is applied. Portfolio margin is tricky business, with lots of nuances. While it's hard to generalise, VAR-based margin is probably the lowest common denominator in the industry. Now guess what happened to the VAR of Pershing's portfolio as VRX dumped? Furthermore, given that the PB suddenly had to post $200mm extra collateral to Nomura and UBS, I doubt very much that they sat there twiddling their thumbs. What probably happened relatively quickly was the following: a) haircuts on evertything in the portfolio immediately jumped; and/or b) Ackman was asked to reduce the VAR of the portfolio and increase unencumbered cash. That's how these things generally work, in my experience (I have some, from 2008, among others). At any rate, to imagine, as you suggest, that a prime broker would just happily sit there as both the AUM of the fund goes down, its exposure goes up AND more collateral needs to be posted to OTC counterparties is, frankly, absurd. In light of all this, Ackman saying "we don't use margin leverage" and "we sold Mondelez for portfolio rebalancing" is just funny. While possibly technically true, I don't think he's fooling anyone. Possibly it's for the benefit of the retail investors in his listed vehicle. Global Trader - it seems unlikely that a broker will take a several hundred million dollar unmargined or non-collateralised exposure against a hedge fund. I know a lot of prime brokers. Its not what they do. Ackman got a margin call. It was relatively small compared to Pershing Square but it will have to be met. Well, forgive me... I am clearly not operating in the same leagues as yourself. A 1y expiry, almost $1bn notional seagull that's lost around 300 bucks is plenty large to me. As to it being relatively small, isn't leverage great? This is a trade that a) has limited upside; b) adds to the fund's exposure, when, as Ackman himself admitted, the fund doesn't have the capacity to add to VRX outright; c) requires cash collateral at the worst possible moment; d) is short the liquidity option when the underlying is gapping; e) related to previous point, is very short vol (since he didn't buy a call, which might have helped); and f) seems to have triggered a cut in a completely different, healthy part of the portfolio. Small, but deadly... Moreover, begs the question: if it's so small, why do it in the first place? Like I said, there is so much wrong and backward and amateurish about this, I have to conclude that the motivation for this trade was, literally, "I cannot possibly be wrong". That's why I think Ackman is such a terrible investor.
" it seems unlikely that a broker will take a several hundred million dollar unmargined or non-collateralised exposure against a hedge fund." so you are saying they had an increase in margin requirements which had to be bet through securities or cash? thats pretty much what I said. " PSH had an increase in the margin requirements, which are still widely covered by everything else. There is no margin call in the sense that they had to sell assets to reduce back down those requirements". the MDLZ sale likely had more to do with expected redemptions than any 'margin call'. the term margin call is used when asset values drop and you reach your min margin requirement, then you have to sell assets to reduce those requirements or wire new funds. thats not what happened, if they had to post securities or cash against the trade, that's not a "margin call" in any relevant sense of the word.
" A 1y expiry, almost $1bn notional seagull that's lost around 300 bucks is plenty large to me." Whatever, man... This "small" trade lost $300mm. If that's chump change for Bill Ackman, frankly, he's an even more terrible investor than I imagined. Furthermore, like I said, if it's a small trade, given its limited upside, why do it in the first place? You can rationalise whatever you wish. Anyone who has traded options for a living for longer than a year and isn't blinded by hero worship like yourself would tell you that it's an awful bet. I am telling you this, but, obviously, you can disagree all you like. Best of luck!